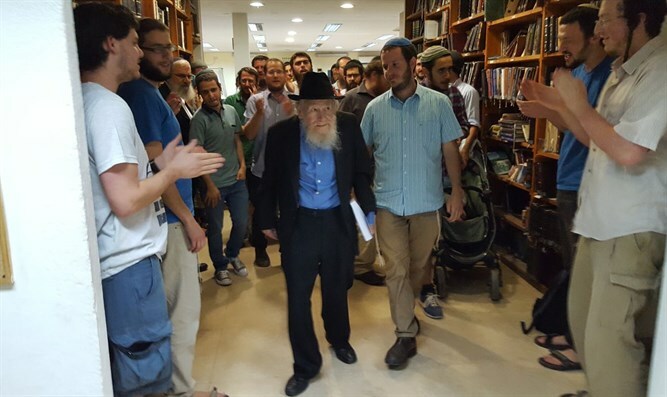 For the first time since his stroke, Rabbi Steinsaltz visits his yeshiva in Tekoa, his students greet him with music and dancing. During a happy and emotional ceremony on Thursday, Rabbi Adin Even-Yisrael Steinsaltz arrived in the Tekoa yeshiva for the first time since his stroke eight months ago. Rabbi Steinsaltz came to participate in the yeshiva students' celebration marking the completion of the Steinsaltz Institute's explanation of Rambam's (Maimonides) Mishne Torah, which was created together with the "Daily Rambam" organization. The explanation on Mishne Torah took ten years to complete, and many of the yeshiva's students and faculty took part in it. The event began with a holiday meal. Some of the yeshiva students played musical instruments, and when Rabbi Steinsaltz entered, he was greeted with happiness and dancing. Afterwards, the yeshiva's dean, Rabbi Michal Falk, spoke and blessed Rabbi Steinsaltz that he should merit to see the fruits of his students' labor. The son of the rabbi who serves as the director general of the shefa institute Rabbi Menachem Even Israel Steinsaltz says: "Every event connected with the rabbi's life's work helps him in his long rehabilitation process. The rabbi has already returned to work at the institute and works on his writings, which is not at all obvious"
Rabbi David Fialkoff, who edited the explanation, spoke about the project and said tens of thosuands of copies had already been printed, allowing the public - everyone from high school students to Torah scholars - to easily learn Maimonides' teachings. Rabbi Steinsaltz is considered to be one of the greatest Talmudic researchers and commentaries. He won the Israel Prize for Jewish Studies in 1988, and has published may Torah books, mostly on hasidic teachings. Rabbi Steinsaltz founded Yeshivat Tekoa, and still serves as its president.